You might remember that we’ve railed against light pollution before, and since we’ve been talking a lot about lighting this week, we figured now would be a good time to bring up the subject matter again. Today we’ve brought in guest writer / night sky activist Anthony Arrigo to talk about the overly-bright light continuing to plague our night skys..
Light pollution affects the vast majority of the inhabitants of this planet. Right here in the US, 19 out of 20 people live under skies that are clouded by light pollution. In fact, more than 2/3 of Americans live in places where they can no longer see the Milky Way at night. This sad state of affairs that speaks volumes about the wasteful nature of our society. In a nutshell, Light Pollution is misdirected or misused light… generally resulting from an inappropriate application of exterior lighting. 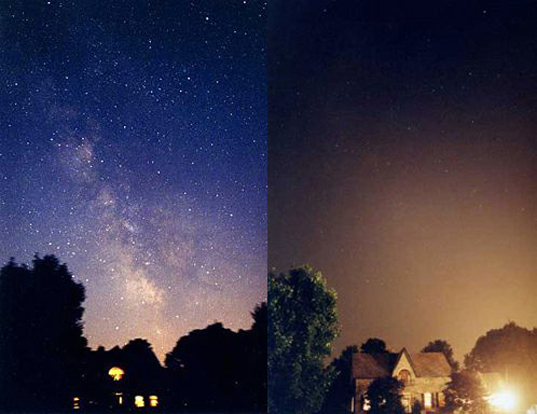 Light pollution is not simply a by-product of outdoor lighting. It is a by product of improperly directed lighting. 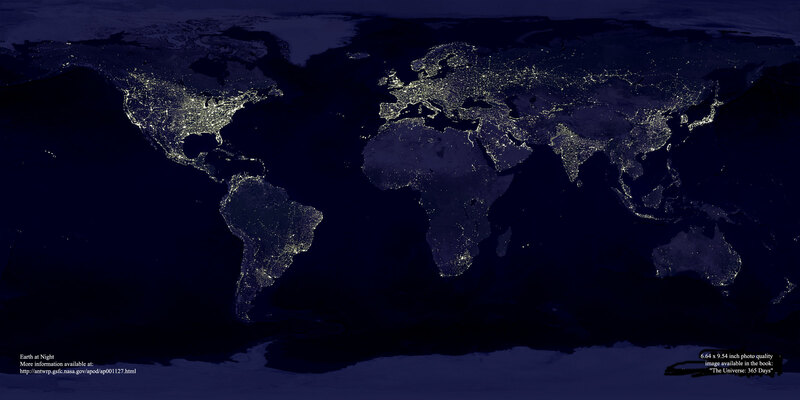 With just a bit of thought and ingenuity, light pollution could be virtually eradicated. Sky glow is light escaping into the night sky and causing a glow over urban/suburban areas. Sky glow is probably the most recognizable aspect of light pollution, and its the glow we see above cities and towns when viewed from a distance. To put the problem in perspective, estimates place the cost to the US in the neighborhood of $5,000,000,000-10,000,000,000 annually. That’s $5-10 Billion dollars with a capital “B”. This is not the sum total of all outdoor lighting, this is just that portion of outdoor lighting that is so misdirected as to light up the night sky. This is an incredible sum of money to simply waste, and yet that’s exactly what we do year after year. In fact, the problem is actually increasing in magnitude and cost. Glare is light shining dangerously out into peoples eyes as they walk or drive by. Improving nighttime visibility is the number one reason for installing lights, and yet often times the lights we install to help us to see at night actually hinder our ability to do so. Sadly, improperly chosen exterior light fixtures are almost the norm. Glare is the result of an excessive contrast between bright and dark areas. Glare is a particularly important road safety issue, as poorly shielded lights along roadways may partially blind drivers or pedestrians and contribute to accidents. Light trespass is unwanted light shining onto a neighbors property or into their home. Light trespass is probably the most offensive form of light pollution as, often times, it affects people inside their own homes. Forget about sky glow robbing us of star-filled skies, light trespass intrudes into our most private lives. See if you have any light trepass in your own home… After dark tonight, open up all the curtains in your home and then turn off the lights. Wait a few moments for your eyes to adapt. Then, pay a visit to the to each room in your home. Odds are quite high that at least a few will show signs of light trespass. Take note of any light shining onto the ceilings or walls. This is light trespass. Look out the window and you can identify the trespasser. It is very likely one of your closest neighbors. How can we stop this insidious spread of artificial light into our nighttime skies? 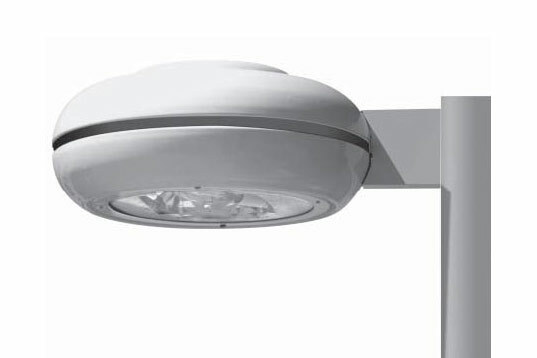 Full Cutoff fixtures are fixtures which directs all emitted light down towards the ground. These type of fixtures come in all shapes and sizes. The common, defining characteristic is that the light source is usually contained within a solid housing. By controlling where light goes, we can more efficiently use the light that is generated. Higher wattages are not needed, since we’re no longer wasting vast quantities of light.. As a result, these fixtures generally consume far less energy for a given lighting task, placing them high on the list for efficiency minded lighting engineers. Full cutoff fixtures provide better visibility with lower operating costs for a win-win situation. Light pollution is a common, pervasive problem in our technologically advanced society, yet it is not a natural outgrowth of progess, but instead a byproduct of our incredibly abundant and wasteful society. Light pollution only exists because we allow it to exist. The technology to prevent light pollution has existed for years, but it is the societal lack of concern that has allowed it to grow into a multi-billion dollar problem. Outdoor lighting is a fact of life in our 7x24x365 society. 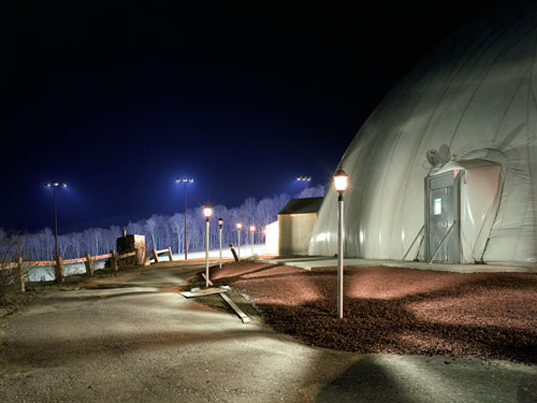 We need outdoor lighting to enable us to get around and conduct our affairs safely. Proper outdoor lighting is not about doing without light – but instead is about using light only where, when and in the quantities needed. Using the minimum amount of light & energy for a given task should be the goal of every lighting engineer, and the standard against which all their work is judged. Guest writer Anthony Arrigo is an avid astronomer and night sky activist. His company, Starry Night Lights, specializes in night sky friendly outdoor lighting products. Boycott Wellington Limited of Midland, Michigan. The proprietor and his girlfriend flood my property with 900 W of CFL light for 5 hours every night. In that time, they only spend 2 hours at home and spend 5 minutes walking their dogs in the supposed security of these lights. My aurora viewing and photography have been destroyed by their flagrant actions. And their response, we don't care. There have been a number of studies done recently which focus on the health risks of light pollution. These were available through the third link above or (http://www.starrynightlights.com/lightpollution/light_pollution_and_human_health.html). Many people want write light pollution off as an insignificant problem... these are (generally speaking) people who don't really understand the problems associated with light pollution. For all the resistance to changing our wasteful outdoor lighting habits, you'd think that the dark sky movement were calling for people to live in the dark. The goal of dark skies is simply to use light when, where and in the quantities needed... but no more. Why shining giga-watts up into the night sky seems reasonable to some is simply beyond me. According to T.S Wiley and Bent Formby artificial light at night also causes cancer, diabetes, depression, high blood pressure etc. Let's take that into account as well. Excellent post. Skip: You probably don't get the overall picture of the problem. Money spent on wasted electricity is being payed by the tax-payers, not the goverments, so it does affects us. Also, $5-10 Billion dollars of excess electricity is responsible for millions of tons of CO2 emissions being released to the environment. Or just think of it as a few nuclear power stations less (which by the way are too payed by the taxpayers to be built). I guess, what I'm trying to say is that there is more than meets the eye. It's a chain really. A small change can make a huge difference. I agree with the majority here. I live in rural Wales and light pollution may not be as big a problem as in urbanised areas but the affect is still noticeable. When I do go the larger cities during night hours I find the sickly orange glow disgusting. 'not worth it if you ask me' In response to that surely seeing the night sky in full glory where ever you are, saving millions of watts of light energy, oh and saving that, soon to be, very precious fuel that pollutes our atmosphere for another day. Bottom line: there's awareness, there's technology, but there's a lack of effort. although i enjoy the night sky, im not sure its that big of an issue for us to go reinstalling light fixtures all over the city. quite frankly from what im told there would still be light polution as it is with newer, better light fixtures. not worth it if you ask me. to be honest i like having to drive a couple of minutes to the nearest mountain to gaze at the sky. its kind of like a short but sweet camping trip. I literally Stumble!d onto this website and I couldn't agree more. When I first moved to Oregon, I could see nearly every star in the sky, now I'm lucky to see even the brightest stars. Aside from the financial burden these lights put on taxpayers, we are hindering our ability to enjoy the brilliance of a night sky. Something our children will likely never experience. I agree wholeheartedly. If we can save money and get a better view of the night sky then why aren't we doing so already? I a dense urban context, some trees keep their leave during the winter because there is no more "night season" for them. That may be not the first on the list, but is part of the global problem. It affects at least 50% of our time. "let those that spend it worry about their money." You mean the tax payers who are funding all the lovely looking (during the day) street lights that are shining up into the sky instead of down into the *street*? 'Cause that's me. Congratulations for bringing this issue to light. It is wasteful and it has often annoyed me. I attended a star show once, put on by an astronomy organisation and we were out in the bush. There was no white light allowed for miles and it was a large site. The veiw of the stars was amazing and I feel it is a real deprivation that I can't experience that view more often. All of the reasons mentioned make it worth considering. The Canary Islands Community has legislated outdoor light pollution for more than ten years. Mainly because their astronomic observatories, but also because their economy lies in turism and the natural features of wich a starry sky is part of. They say they also save up to 27% of energy consumed for this purpose. It's true that for many it's a non issue, but this case shows that it's something that's not impossible to incorporate. Let's put this into context.....this is not the most pressing of the world's problems to get on's knickers intp a knot. Yes, it may be costly - let those that spend it worry about their money. It certainly does affect astronomers. For most of us, I would be willing to bet it is in the "not an issue" catagory.